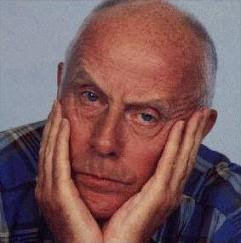 How is is that one of new London freesheets, The London Paper, can run a decent squash article twice in a week while the national press buries the British Nationals in miniscule "sports round-up" results columns? 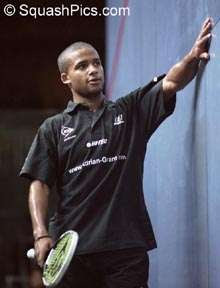 The newbie tabloid (carpeting the capital's pavements from 5pm daily) decided to feature Adrian Grant (pictured) - firstly highlighting the prospects of the Lewisham-born squash player, and then informing readers of his progression to the semi-finals, where he lost to the eventual runner-up of the tournament, John White. Monday's Guardian didn't even carry the results from the finals, only the semis. A thumb though the Telegraph found the results mentioned in brief. It's a shame I didn't pick a copy of the Manchester Evening News to review their coverage; it seems that the local press is far more interested in squash than national newspapers. 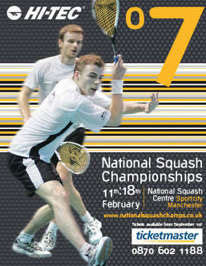 On Sunday I went up to Manchester to watch the finals of the British National Squash Championships 2007. As has come to be expected for this event, the organisation was slick and the standard of play high. The women's final saw a fit and focussed Jenny Duncalf overcome a two-game deficit to defeat Alison Waters, the latter maybe not at full strength after a bout of food poisoning (a point she graciously refused to use as an excuse). In the men's final - played at a blistering pace - James Willstrop defeated John White in a punishing display of guile. I lost count of the number of winners Willstrop dropped in the front-court on the backhand side, out-thinking an opponent who managed to retrieve almost everything. How long can these guys' knees take the strain of so many high-impact lunges?! The crowd - as usual in this city - were excellent, and gave great support to all players. There appeared to be more seating than in previous years behind the back wall, with the back tiers accessible from side gantries. These seats were, encouragingly, all taken, though there did seem to be some confusion of which blocks of seats were which - a misunderstanding caused by tricky labelling on the tickets themselves rather than signposting around the court. 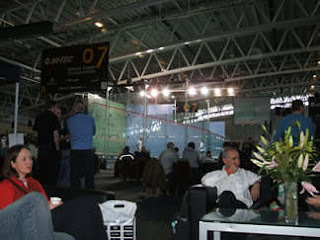 It also was the first time I had taken along my girlfriend to a professional squash event (indeed the first time she had been a spectator at any squash game) so it was interesting to gauge her reactions - not only to the sport, but also to the spectacle as an evening's entertainment. The fact that I didn't have to clarify many of the rules throughout the evening said much for the accessibility of the sport, though explaining the difference between a let and a stroke left her somewhat miffed. It was clear that this year's event was bigger and better than in previous years when the dry ice started billowing from the players' entrance tunnel. The walk-on music over the PA was cranked up to a thunderous volume - and that was just for the arrival of the compère. Andy Nickeas: more of this please! 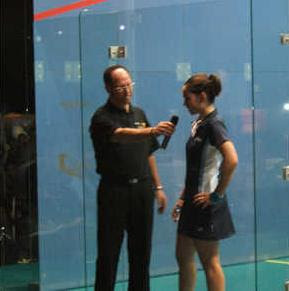 For me, a large part of what makes events at the National Squash Centre stand out is Andy Nickeas (pictured, with winner Jenny Duncalf) as master of ceremonies. His knowledge of the players' standings and reputations is excellent, but importantly for big events like this he injects excitement into the crowd; he hypes a coming clash through an assured. understated delivery while avoiding the hyperbole that risks leaving us underwhelmed. Other sports fall victim to over-hype: squash doesn't get enough of it. Although the men's final treated us to an astonishing display of skill, commitment and sportsmanship rarely seen in sporting contests of much greater media profile, it was not the confrontation many in the audience hoped to see. Lee Beachill - winner of this title three times - had to retire in his semi-final against Willstrop due to a neck injury, and many were hoping that the friends and training partners would meet in this year's final. The draw and the former champion's misfortune meant that this would have to wait for another year. Willstrop was a worthy winner, evident in Andy Nikeas's speech, when he spoke how James as junior had dreamt of one day playing on a glass court. I wonder if it was time constraints in the schedule that meant that the runners-up weren't interviewed before the winners (as is usual) after the matches. I thought this a little rum, though Waters in particular looked a forelorn figure on her chair by the court, so it was probably a blessing in disguise. Having not known who was in the final of both draws before I arrived at Sportcity (my hotel proudly boasted wireless internet access, though I helpfully neglected to bring a laptop), I found Duncalf somewhat a surprise finalist (and winner). I've seen her a few times, and haven't witnessed the steely resolve manifest here against Waters; hopefully this success will infuse her with the confidence to put one over bigger names on the WISA tour. Walking out to the taxi past the City of Manchester Stadium, I asked my girlfriend if she had enjoyed the evening. 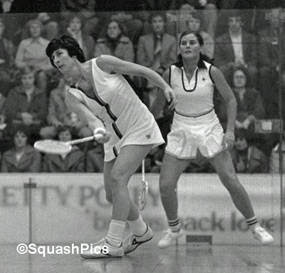 She had - very much so - and was pleasantly surprised by how dynamic squash could be as a spectator sport. "It's the little things that really show up"
Over dinner at Dimitri's in the city centre I explained to her squash's image problems and the difficulties of maintaining a professional tour given the dearth of money around the sport. 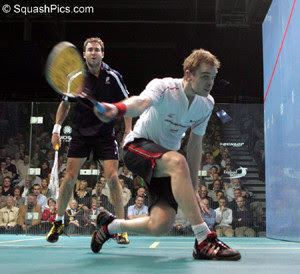 We both agreed that the event we had just witnessed was a well-organised event that was a great advert for professional squash; for someone like me who has been to many tournaments, I could appreciate how the Nationals do things better than other events. I asked my girlfriend (who has been to many other sporting events) if there was anything she thought could have been done better. She laughed: there were a couple of things - insignificant to most of the audience, who could probably be classed as the 'squash community', but "it's the little things that really show up". She elaborated. At one point duing the women's final, one of the stewards (almost certainly a volunteer) shouted "come on Jenny!". The comment was probably ignored around her, but was unprofessional coming from a staff member who, by virtue of her position, should be neutral in her allegiances. Here the comment fell on deaf ears; if it has been in a Wimbledon tennis final with half a million dollars at stake, things would have been taken a lot more seriously. Her second point was - on the face of it - even more trivial. The draw to win a squash racket at the end of the day was won by one of the volunteers rather than the audience, when it was the audience who were encouraged to buy programmes in order to enter the draw! From the compère's comment, it wasn't the first time this had happened. These two incidents seem small, but to an new audience member they take the gloss off proceedings and cast a shadow over the professionalism that was evident throughout the day. As a national rather than international tournament, this event can perhaps be excused from being more "inward" looking than others, though those who seek to raise the profile of the sport shouldn't forget that there may be those in the audience seeing the sport for the first time, and that first impressions last. These tiny observations aside, this year's Nationals was one of the best ran and most eagerly supported events I have attended - and a squash convert left Manchester that day. It's a perennial favourite of sports pollsters to wheel out their "Who's the greatest?" charts, and I've read many posts where squash fans contribute to similar lists. It's a lot of fun and whiles away many an hour in the pub. 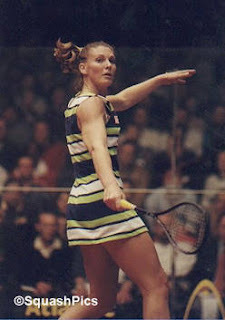 The inherent flaw within this speculation, of course, is that many of us aren't old enough to have seen a player from an earlier era in their prime (though I bow to the wisdom of the more "mature" members of the squash community who witnessed Hashim Khan or Heather McKay at the height of their powers). Squash poses an even trickier task for those who try to make comparisons between the overall strength of the professional game in different eras, as it has been dominated by a relatively small number of players; a glance at the previous winners of the British Open is a good indicator of this. The recent announcement of new big-money men's tournaments in the Middle East was announced a few weeks before I read that the 2007 Women's World Open was sadly under threat as the sponsors had pulled out. This difference in fortune between the men's and women's game had me wondering about the relative strengths of the games and whether overall playing standard and competitive appeal (or, as I rather suspect, a multitude of other factors) is indicative in any way of the contrasting luck in attracting audiences and sponsorship. Another check back at Wikipedia shows that the men's World Open was not held in 2000 or 2001 due to similar difficulties in securing sponsorship for the event. The current era benefits from heightened competition in that no one player in either the men's or women's game is dominant (though one could argue that Nicol David is creeping towards this position). Greater competitiveness and a sense of unpredictability in sport should in theory attract greater audiences. However, there is an important difference between the strength of a sport as borne out by results and how it is perceived by those who choose to watch or invest in it. Some would rather go and watch one individual superstar trounce his or her opponents week-in, week-out, than back an underdog in a wide-open tournament. It is also unfortunate that women's sport in general receives less money than men's - for example, each summer tennis commentators debate the injustice of women at Wimbledon receiving less prize money than their male counterparts. I am sure there is a straightforward explanation why the sponsors have withdrawn from the Women's World Open, and I have my fingers crossed that WISPA finds a more than suitable replacement sponsor and venue (maybe in the USA?). It would be interesting to hear, though, what others felt about the strength of the modern women's game. There's some useful squash coverage on the BBC website this week. James Willstrop is interviewed by Chris Evans in 5-minute clip talking about the British National Championships and life as a professional squash player. A news article - Squash builds Manchester's legacy - highlights the success of the National Squash Centre post-Commonwealth Games. 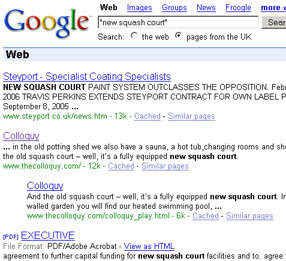 An irreverent and largely pointless Google search this afternoon led to a remarkable discovery: new squash courts being built in the UK! 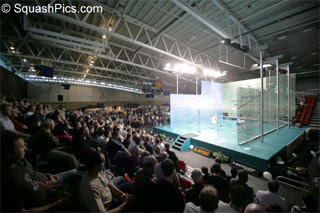 I had drifted back to the BBC article on squash's popularity that I commented on a few weeks ago and wondered if any kinds souls out there were reversing the trend by building courts. And the first award goes to ... Bromley Cricket Club! A recent meeting of the Bromley Environmental Services Department approved a request from the Club to build a new squash court to complement the existing provision. An inspiring story on the BBC goes to show that a disability is no barrier to playing squash. Alice Harvey, aged 10, from Shirley near Solihull, lost both legs after developing meningitis. She is now a top player, ranked 15th (Feb 2007) in the country for her age group - remarkable considering she uses two artificial legs. Great to see three Egyptian players in the top 10 of the PSA world rankings. Those in the know recognise a flair for shot-making as a feature of the Egyptian game. I've been lucky enough to see Amr Shabana and Karim Darwish in a number of thrilling contests - their racket work some of the most exciting since Jonathon Power's retirement. With Ramy Ashour bursting on to the senior Tour, squash in Egypt looks in a very healthy state: maybe this will stir wider interest in the game in Africa? Be sure to catch any of these guys if they're in town! 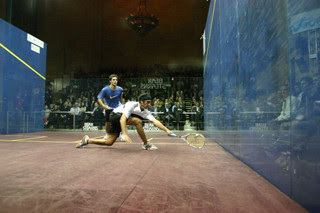 STOP PRESS: Ashour has just been added to the line-up for the 2007 Canary Wharf Classic.